What is “Coyote Cash” mobile slot about? Coyote Cash is a progressive jackpot slot from RTG Realtime Gaming; it is a 5-reel, 25-payline video slot. 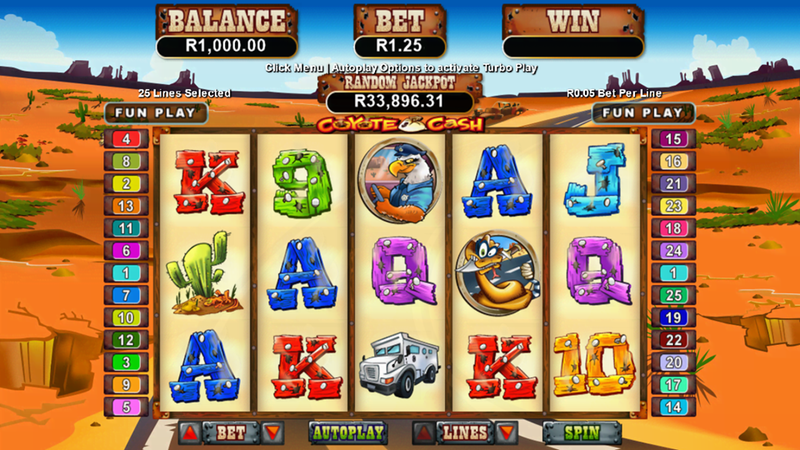 The game has various features which include a wild symbol, scatter symbol, multiplier and free spins. The maximum coins jackpot comes up to 10,000 coins with 25 being the maximum number of coins and you get to bet 1 coin per line. You do not get a bonus game in this slot. The maximum jackpot in cash depends on the number of games you play as the jackpot amount increases with more games. The backdrop of Coyote Cash is based on a wild west robbery theme with the settings resembling the Road Runner cartoons from Looney Tunes. The main character of the game is Coyote, also loosely modelled on the Wile E. Coyote from the cartoon show. The various symbols you get to find in the game are that of the Coyote, evil snakes and birds, cacti and some authentic poker symbols. You get to hear some funny sounds when a winning combination is achieved. The game is compatible on Android smartphones, mobile phones and tablets, and also on iPhone. Upon entering Coyote Cash you get reminded of your childhood with the cartoon characters playing the central characters in this game. You can wager only 1 coin per payline, but the coin denominations can very from $0.01 to $5 giving you a maximum line bet of $5 and a maximum total bet of $125. The progressive jackpot is awarded randomly while you are playing the game. The highest fixed jackpot pays you 10,000 coins only if 5 Coyote symbols are lined up in the active payline. The Coyote symbol acts as the wild symbol and this symbol can replace any other symbol on the reels to form a winning combination. The amount you get is doubled, if you substitute the wild symbol for another symbol and win. The cash bag you have in the game is the scatter symbol and if you get 2 or more scatter symbols anywhere on the reels then it enables the scatter pay-out. The winnings become 200 times the total bet if you get 5 scatter symbols on the reels. At the maximum this earns you an amount of $25,000. If you end up with 3 or more cash symbols then the free spins round is triggered which can get you to play 20 spins and everything won thereafter will be multiplied by 2, 3, or 4 based on the number of loot bags you strike. The interesting thing about this feature is that it can be re-triggered again and again. Grab the bag of gold and hit it big!